Mon., April 23, 2018, 5:07 p.m.
BIRMINGHAM, Ala. – Josef Newgarden banked on the rain at Barber Motorsports Park, and it was a pretty safe bet. With a sizable lead and showers starting anew, Newgarden made his second pit stop with about 15 minutes left in the timed race to switch to rain tires. Contenders like Sebastien Bourdais and runner-up Ryan Hunter-Reay remained on the track while the rain soaked the course. That’s why Team Penske president Tim Cindric told Newgarden on the radio they were racing the weather at that point, not other drivers. He won for the second time in the first four races of the season. Bourdais stayed on the track, trying to keep a grip on both the lead and the 2.38-mile (3.83 kilometer) course. He finally relented for a pit stop and Newgarden built a 25-second cushion that wasn’t challenged. He finished 10 seconds ahead of Hunter-Reay, followed by James Hinchcliffe , rookie Robert Wickens and Bourdais. Alexander Rossi entered with the points lead after winning at Long Beach but finished 11th. Hunter-Reay said it boiled down to balancing the pit strategy just right. “Newgarden was right on the cusp,” he said. “Had it gone another three or four laps, he might have been in trouble with the time that he pitted, because it was still a little bit dry when he took his rains. Hinchcliffe, meanwhile, got his first podium at Barber. “I feel like we kind of almost flirt with it every year,” he said. It was the sixth win in nine years in Alabama for Team Penske. 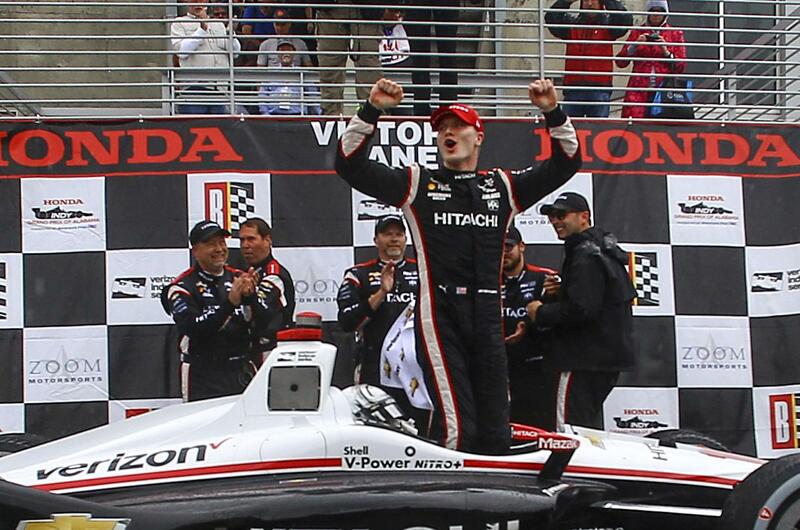 Newgarden got his ninth career victory after leading 72 of 83 laps. Published: April 23, 2018, 5:07 p.m.